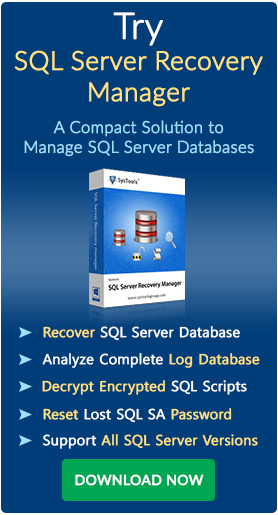 To view SQL MDF file when they are inaccessible due to corruption happened with SQL server database, get the MS SQL MDF reader installed via free of cost download option activated to help user to avail the freeware service to view SQL MDF database for free. Help to view MDF file without SQL server thus help user to make it sure MDF file carries database that can be recovered safely. SQL server MDF file viewer works on both corrupted and healthy MDF files to view content of corrupted MDF file database reliably. Free download option help to get answer for query of how to view MDF file database free of cost and open SQL MDF file to check content inside. Now Download SQL MDF Viewer which is highly effective and user friendly in its functionality and thus to view SQL MDF database and even to view MDF file without SQL server the free tool is good option, but to overcome the limitation of only view and not to recover SQL MDF database to healthy base, user need to move for purchase of SQL Recovery software, that allows to view, recover and save SQL MDF file to healthy format with a nominal investment made on full version purchase.